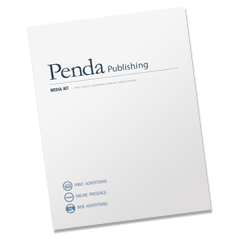 Penda Publishing offers affordable, effective advertising options in all of our publications. We are community focused and professional enough to tend to large corporate advertising while still being able to engineer successful advertising campaigns for small businesses. New to advertising? You are in good hands. Penda Publishing's experienced account representatives will guide you painlessly though the process. We have a fully staffed, in-house team of designers to bring your ideas to life! And as always Penda Publishing's prices are competitive and surprisingly affordable on any business’s budget. Thrive in this harsh economic environment. Be where the people are, in our free weekly publications. Get your name out there, get seen, and get business! Submit your ad! Email your ad to an account representative. Don't have a representative? Make an appointment with one!